I have combined 6 sets of differentiated seasonal learning materials that target language and literacy, vocabulary, sequencing, emotions and social skills, as well as math and number skills to 20. 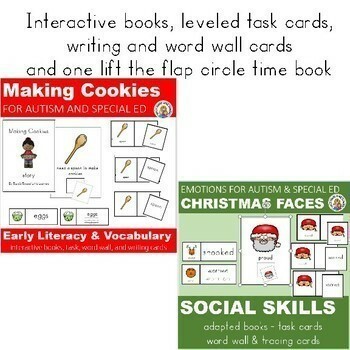 Over 100 pages of interactive books, task cards and ready to use counting and question cards. 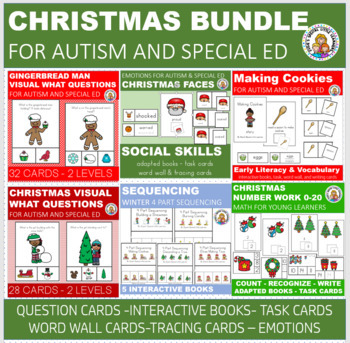 The bundle is a must have for young learners with autism or special needs. 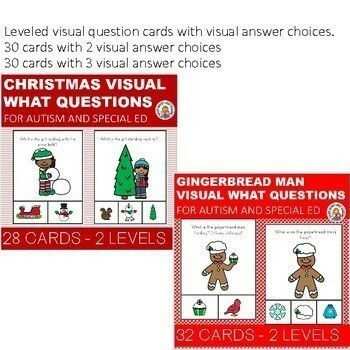 I have included both the Christmas and Gingerbread Man sets of seasonal visual what questions. You get 30 page of activities to use with your little learners. Each card features a visual question with visual choices for answering. There are 30 cards with 2 visual answers and to choose from and 30 cards with 3 visual answers to choose from. You get a total of 60 cards! This is a wonderful resource for early learners that are new at answering what questions and require support to build a new skill. Take home book A black line half page book featuring one picture and a simple sentence on each page. This huge set includes over 50 pages of learning materials including leveled interactive books and clip cards targeting counting with 1:1 correspondence and number recognition, as well as tracing and writing numbers, from 0-10 and 11-20! The cards are LOW PREP, just laminate and cut the page. The interactive books are great for students with emerging counting and number recognition skills. This set is an awesome addition to your word boxes or small groups. 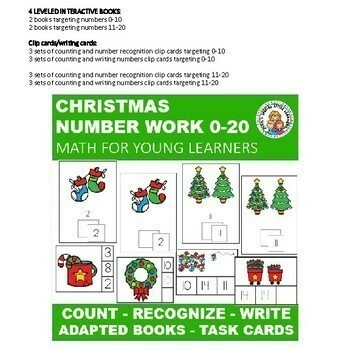 Christmas themed math materials add a little bit of seasonal fun to your school day. This series of sequencing activities are a fun and engaging way to help your little learner learn how to sequence 4 pictures. First, practice matching the pictures, then fill in 1 out of 4 missing pictures, next 2 out of 4 missing pictures, then 3 out of 4, and finally sequence all 4 pictures!